SKU: . Category: Cultural heritage, Kasli. 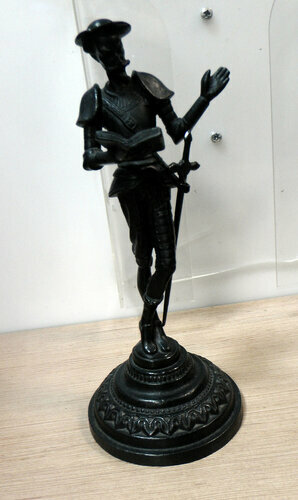 Don Quixote “Man of La Mancha” Cast Iron Art Figure from the KASLI Iron Works in Russia. Nicely detailed lost-wax iron casting from the Kasli Iron Works in Yekaterinburg (Ekaterinburg) in the Ural Mountains, Russia. This significant mountain ridge forms the border between Europe and Asia. Kasli Casting (named after the town of Kasli) is a metallurgical and metal-working plant which rose on the banks of the river Iset, and was one of the best of its kind in its day. 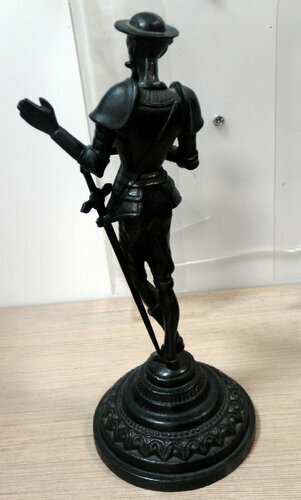 The figure is in excellent condition and has a detachable sword. The figure of Don Quixote is mounted on a pedestal base, which is marked in Russian “Kasli”. Date of production is mid to late 1980s. 8″ tall, nearly 1½ pounds. ART ALBUM. Greek gold. Jewelry art of the classical epoch V-IV centuries BC.